April 10th's episode of House was, again, not chock full of New Jersey references. Last week House talked about the Princeton tiger mascot. But who doesn't know that? This week the only reference worth commenting on was the little paper with the phone number on it. The one for the young professional woman with the heart of gold. Yes, that one. When Wilson opened it up and dialed the 609 area code was correct for the Princeton area...although why she wrote her area code for a local call is beyond me. I'm sure all the 609ers watching were pleased for the accurate shout out...so thanks to the writers/set decorators/prop people for that. I apologize to anyone who has looked here for information regarding Princeton/New Jersey locations on House. But it isn't really my fault. Apparently with all the success of the show the creator and writers have forgotten where home is. NEW JERSEY! So today I get an email from an obviously friendly and intelligent guy named Andy. He remarks on the restaurant and the backwards reflection in the Alchemist and Barrister-ish (a comfy little restaurant that's been there for decades) restaurant window advertising the hardware store across the street. Andy, you're right the location of the hardware store across from the Alchemist is correct. I want to believe, like you, that that locale was an homage to a lovely little spot just a few blocks from the University in one direction and the Medical Center at Princeton in the other. We'll just stick with that. (Andy and I are smiling now...each lost in our own memories of Old Nassau). Along with the ending shot there are some other things that are "local". The stage on which Patrick/Dave Matthews was getting ready to play looked to be McCarter Theatre. A well known and wonderful theatre renovated well beyond it's original form and located at the edge of the Princeton University campus right next to the train station where you can catch the "Dink". And Cameron's applying for a job a Penn would be realistic. Penn, of course, is the University of Pennsylvania...a world class hospital just an hour south in Philadelphia. I am disappointed that those who put House on the air have really neglected the environment that is Princeton and the area that surrounds it. There are statues on the street, great stores and restaurants. Why doesn't House frequent The Princeton Record Exchange? There is a very interesting statue outside the Medical Center at Princeton that includes a wheelchair that would amuse and entertain Dr. House for hours, not to mention provide him with ways to annoy and surprise those blasted friends of his. What do you say guys? Can we "see" some more of New Jersey? Great episode! I'm sure if you're reading this you thought so too. All those who are glad our favorite doctor is back grab your skateboards and meet me on the Princeton University campus. That's where that skateboarding appears to have taken place. Much, if not all, of the old "cobblestone" walkways were re-done with those more modern bricks. And House appeared to be joggin along Lake Carnegie which runs along the campus as well. He also jogged through the campus. 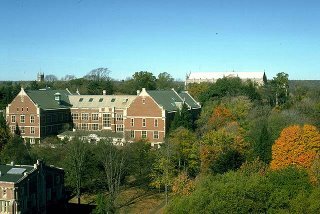 There is no hospital on the campus of Princeton University and there is no medical school there....but that's what it would look like if there was. I wonder when the filming was...would love to catch a glimpse! Hi. Pennie here. What a chock full show to be my first entry!!! As you can tell from the synopsis of the two episodes there was a lot of action...but nary a mention of our beloved NJ. As a born and bred native of the state...I did not recognize the alley in which the episodes began but the view from the officer's pigeon deck captured what appeared to be the Trenton skyline down along the Delaware, which we must assume was the location is the oldest part of the city. The home are built in the style similar to the policeman's apartment. The large white square office building looks exactly to be the state office buildings in that part of town. There were quite a few times that we saw that big white building so I am assuming we were meant to. Not sure if it was a location shot or a similar building someone found. A view of the state house's gold dome or even the planetarium next door would have proved an actual location shot. But the building is certainly correct. Again...the campus of the hospital is actually an aerial view of Princeton University (which has no medical school and is not affliated with the University Medical Center at Princeton). Having been to what I will probably always call Princeton Hospital (that's what it used to be!!!) and having had occasion to sit in the chapel...it looked to me that whoever described the interior to the set designer had to have spent some time there too. The chapel is a peaceful small room. A nice place to sit and think as Forman's father found out for himself. Did I miss something? Questions? Additions? Let me know! This blog is being taken over by Pennie. The old postings by Jersey Girl will look as if they came from Penny (as does this post) but only the posts after this one will come from the new owner of this blog. We are currently experimenting with this blog even changing the way it looks. But from now on we, who have only a slight acquaitance with New Jersey, hope to learn about references we may have missed or be confused by in past and future episodes. Season 1 - Episode 4 - "Maternity"
In this episode, we have some new references, and a number of old ones. There is a spoken reference to "Princeton General Hospital". It doesn't exist. In the scene where the female clinic patient brings in her husband and they confront House by his office, you'll see above the double doors, behind House's head "Carnegie Wing." This is undoubtedly a reference to Lake Carnegie and Andrew Carnegie. There's an interesting story here ... Princeton University students had long complained of the lack of a satisfactory rowing venue. In the 1870s, the crew team tried rowing on the Delaware and Raritan Canal, but it was too narrow and heavily traveled. One day Howard Russell Butler (Class of '76 ... 1876, that is) happened to run into Andrew Carnegie, the Scottish-American businessman and philanthropist and founder of Carnegie Steel Company (later to become U.S. Steel) while both were traveling on the train affectionately known as the Dinky (still runs between the Princeton campus and Princeton Junction and is usually only one car, hence the name). Butler aired his complaints to Carnegie who had built a number of lakes in his native Scotland. He was intrigued and asked Butler to research what it would cost to fulfill Butler and his friends' dream to create a lake by flooding the wetlands south of campus. Butler sent Carnegie a letter dated July 16, 1902 stating it was feasible and should cost just over $100,000.00. Carnegie agreed to fund the project. Four years later, the 300-acre marsh and surrounding land was purchased, the vegetation removed and mud dredged out by horse-drawn wagons. An area of Stony Brook and the Millstone River between Kingston and Princeton was dammed, flooding the area to a depth of 12 feet. Princeton now had its lake ... three miles long and up to 800 feet wide. Lake Carnegie was dedicated on December 5, 1906. About the only one not happy with the lake was Princeton's 13th President at the time, Woodrow Wilson (yes, *that* Woodrow Wilson ... he didn't become U.S. President until seven years later). Both he and President James McCosh before him had tried many times to get Carnegie to make a donation to the University without success. Instead Carnegie gave the University a lake. It is said Wilson remarked, "We asked for bread, and he gave us cake." As the husband, wife and House go *around the corner from his office*, we see "McCormick Wing." Keep that in mind, it's important. Later, we see "Mathey Wing" behind Cuddy and Wilson. Later when House is watching the elderly woman volunteer, we see "Mathey Wing" behind him. and that's it for this episode. Season 1 - Episode 3 - "Occam's Razor"
Not much in this one. In the scene where House is confronting the parents, they're standing near a set of double doors that says above them "Cuyler Wing." Cuyler Hall is a dorm on the Princeton University campus. Season 1 - Episode 2 - "Paternity"
Now we have the regular opening sequence, which has seemed to have caused some confusion. 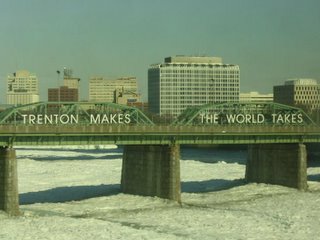 I've seen the bridge shown referred to as the "Trenton Makes" bridge. This is incorrect. That bridge spans the Delaware River. You can see from the photo that this bridge looks nothing like the one in the opening sequence. (The Delaware is partly frozen in this winter shot.) 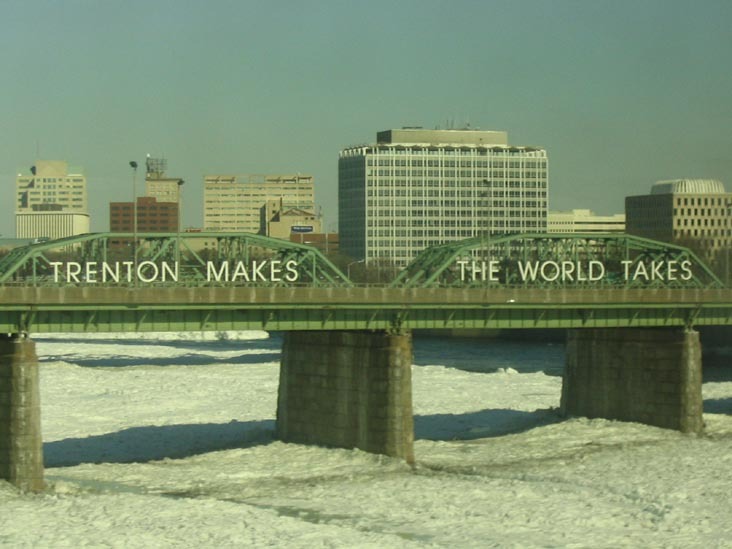 Also, notice the city of Trenton ... no woods there! It's typical to see sculls on the water. If you look at the far shore, towards the background, you can see the University boathouse through the trees. I don't ever recall knowing a name for that particular bridge. It may have had one, but I never heard of one. We just referred to it as the Washington Road bridge. 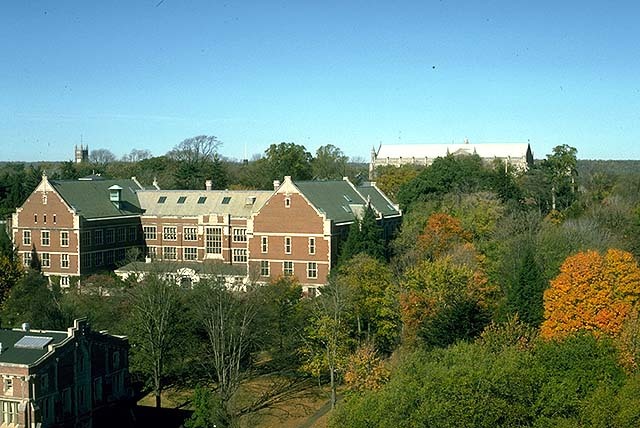 Washington Road runs from Princeton Junction to the heart of the Princeton University campus. I was tickled that the clinic patient was from Maplewood, a very wealthy town in northeastern New Jersey. I went to college near there. You could get finger sandwiches and a pot of tea at the Lord & Taylor's there for $1.50. A lot of us college students went there for a delicious, cheap lunch. In reality, Maplewood is only about 40 miles from Princeton, not 70 as House says. Later on, when House is talking to the clinic patient and they're walking through the double doors, you get a good look at the words "Witherspoon Wing." They then stand in front of another set of double doors over which it says "Mathey Wing." Mathey College is part of Princeton University. It was dedicated in 1983. It's one of five underclass residential colleges. Season 1 - Episode 1 - "Pilot"
There is no such place as PPTH. This fictional hospital is based on Princeton Hospital, now known as University Medical Center at Princeton and is located at 253 Witherspoon Street. I was a patient there in the early 1970s. Albert Einstein died there in 1955. Now to the episode ... In the scene where House, Foreman, and Cameron were talking and House mentioned an "MRI from Trenton County", meaning Trenton County Hospital, there is no such place, and no such county. The reference would be to Mercer County Hospital, now known as Mercer Medical Center, located at 446 Bellevue Avenue in Trenton. When House walks up to his colleagues and says "No treatment", look up at the area over the doorway in the background and you'll see the words "McCormick Wing." There is a McCormick Hall on campus that is home to the Department of Art and Archeology. I got such a kick out of the orange guy in the clinic. I'm wondering if this was an inside joke. Princeton University's mascot is the tiger. The school colors are orange and black. I laughed when House told the guy his wife was having an affair, because she hadn't noticed her husband was orange. Truth is, if this was during Homecoming, *NO ONE* would notice!!!! People dress up in the most unbelievable orange and black outfits. (I was always impressed by the fluorescent orange shoes!) I've seen people with faces painted to look like tigers. I saw one man with half his face painted black and the other half orange. So, seeing a completely orange guy wouldn't make anyone bat an eye! Hi Everyone! I hope you'll enjoy learning more about the New Jersey locations seen in House, M.D. The show is set in the Princeton, New Jersey area. I lived in that area for over ten years. It's a place that I really loved and have many fond memories of it. It's a beautiful place that's full of history. The "major attraction" there is Princeton University. We, the editors of House MD, welcome this blog about the Princeton area mentions on House MD. When I was in high school in Hopewell Township the only place to go that had anything to do was Princeton. Nassau Street. Bamberger's. The Playhouse. PJ's Pancakes. And Hulit's was the ONLY place to buy shoes. And the closest hospital to my bucolic homestead was the old Princeton Hospital. Well, I went to college in Lawrence Township, got married in Trenton, moved to Hamilton, and gave birth to my children in (the new) The Medical Center at Princeton. And here I am. I moved from Central to South Jersey. My orientation has changed from NYC to Philly (there is an invisible dividing line somewhere in the Pinelands that separates Giants fans from Eagles fans). And I spend one hour every week watching House on my TV hoping someday to bump into the man himself coming out of the hospital parking garage on Harrison Street! Heck I'd even get sick and go wait at the clinic!